European football returns in midweek, with action in the UEFA Champions League and UEFA Europa League taking place. Manchester City make the trip to Hoffenheim, while Manchester United host Valencia on Tuesday. The following day, Tottenham Hotspur and the mighty Barcelona lock horns, whereas Liverpool travel to Napoli for what could be a challenging evening in Italy. In the Europa League on Thursday, Arsenal are out in Azerbaijan to play Qarabag. A few hours later, Chelsea entertain MOL Vidi at Stamford Bridge. Both English sides will be hoping to make it six points out of six in the Europa League with wins on Thursday. The Champions League got off to a thrilling start on matchday one. Man City fell to a shock home defeat to Lyon, while Tottenham conceded two late goals to lose 2-1 at Inter Milan. Meanwhile, Man United sealed a comfortable home win over Young Boys, and Liverpool edged a five-goal thriller against Paris Saint-Germain. There will no doubt be plenty more thrills and spills this week. Pep Guardiola’s Man City travel to Germany to face Julian Nagelsmann’s Hoffenheim at the Wirsol Rhein-Neckar-Arena on Tuesday. City currently sit bottom of Group F after a surprise defeat in their opening match. Will Pep’s troops hit back with a win on Tuesday? Hoffenheim claimed a decent draw with Shakhtar Donetsk in their opening match, drawing 2-2 at the Metalist Stadium. Man City, meanwhile, fell to a disappointing 2-1 loss to Lyon at the Etihad Stadium. That reverse remains the Citizens’ only defeat in all competitions this season. Guardiola’s boys will be eager to hit back after an uncharacteristically poor showing against Lyon in their opening game. BetVictor are offering 17/10 for City to win to nil in Germany on Tuesday night. Jose Mourinho is a man under serious pressure at the moment. Having lost two of their last three, Man United will be desperate to get back to winning ways when they host Marcelino Garcia Toral’s Valencia at Old Trafford in Champions League Group H on Tuesday evening. United kicked off their European campaign in style, with goals from Paul Pogba (2) and Anthony Martial enough to secure a 3-0 win at Young Boys. Since then, however, the Red Devils have lost to Derby County in the EFL Cup and to West Ham United in the Premier League. Marcelino’s men, meanwhile, were beaten 2-0 at home to Juventus in their opening Champions League game. This is a vital fixture for United as they look to get their season back on track. Tuesday’s clash could be a tricky game, but we’re backing Man United to edge it in front of their home supporters. Take a punt on the 2-1 home win at 7/1 with bet365. 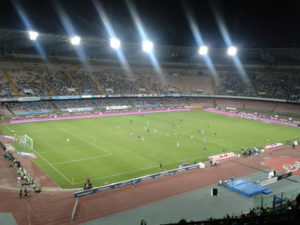 In Group C on Wednesday, Carlo Ancelotti’s Napoli host Jurgen Klopp’s Liverpool at the Stadio San Paolo. This should be a cracking fixture between the pair, which could go either way in Naples. Napoli failed to pick up a win on matchday one, as they were held to 0-0 draw by Red Star Belgrade in Serbia. As for the Reds, they sealed a superb 3-2 win over Paris Saint-Germain at Anfield, with Roberto Firmino scoring late to give Liverpool the perfect start. Although this has the potential to be a tough fixture, Liverpool are good enough to leave Italy with maximum points in midweek. Take a punt on the away team to win at 23/20 with Betfred. Mauricio Pochettino’s Tottenham and Ernesto Valverde’s Barcelona lock horns in a mouth-watering Champions League Group B match at Wembley Stadium on Wednesday night. Barca lead the way in the group after a comprehensive 4-0 win over PSV Eindhoven at the Camp Nou in their opening game. Things were going just fine for Tottenham when Christian Eriksen’s goal gave them a 53rd minute lead at the San Siro. However, late goals by Mauro Icardi and Matias Vecino turned the game on its head to give Inter a 2-1 win in Milan. Opponents don’t come an awful lot tougher than Barcelona, but Spurs are capable of picking up a point in this one. BetVictor are offering the solid odds of 18/5 for the draw and both teams to score on Wednesday. Arsenal and Chelsea got their Europa League campaigns off to winning starts a fortnight ago. The Gunners were 4-2 winners over Vorskla Poltava at the Emirates Stadium, with Pierre-Emerick Aubameyang helping himself to a brace. Meanwhile, Willian’s goal was enough to give the Blues a 1-0 win over PAOK in Greece. Unai Emery takes his Arsenal side to Azerbaijan to play Qarabag on Thursday night. The Gunners will be looking to make it six points from two games in Europa League Group E.
Arsenal cruised to a win over Vorskla in their first game, although they did concede two sloppy goals at the end in the 4-2 triumph. Since losing at Chelsea back in August, the Londoners have won seven league and cup games in a row. Meanwhile, Qarabag started their European campaign with a 2-0 defeat to Sporting Lisbon in Portugal. In truth, Arsenal should stroll to all three points at the Olympic Stadium in Baku. The away team to win with a -2 goal handicap is priced at 10/3 with Betfair. After a narrow win in Greece on Europa League matchday one, Maurizio Sarri’s Chelsea will be looking for six points from a possible six when MOL Vidi make the trip to Stamford Bridge on Thursday. The Blues are the clear favourites to secure an easy win in this one. Chelsea have made a strong start to their season under Sarri. In fact, since losing the FA Community Shield to Man City back in early August, the Londoners have won seven and drawn two of their subsequent nine matches in all competitions. Chelsea were narrow winners against PAOK in their opening game, but we can see this one being a convincing victory for the Premier League side. Check out the 4-0 home win, which is available at the top price of 13/2 with Ladbrokes.